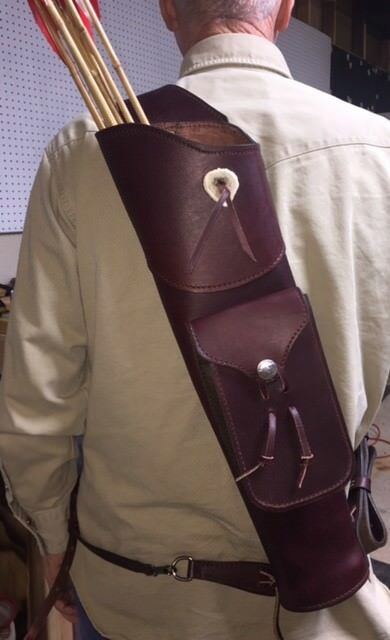 Here is my new Lontree back quiver. These are available in either dark brown or classic brown. 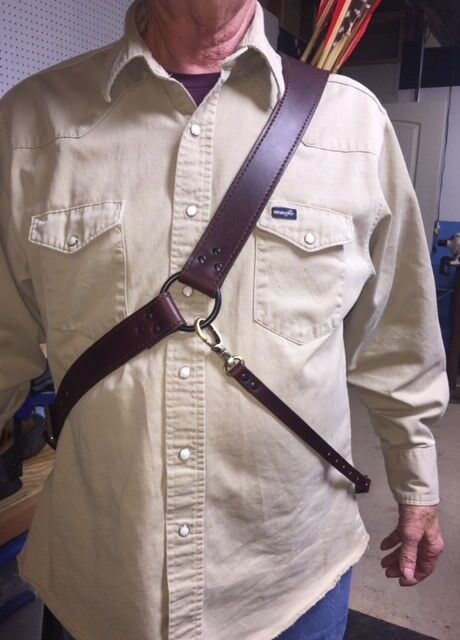 I use 7-8 oz vegtan on each quiver. The shoulder strap is extra wide over the shoulder for comfort and the entire strap is lined with top grain cowhide suede side out. The quiver above is the classic brown. This one is also a left hand quiver. The two pictures above are in the dark brown. One has leather lacing on the top of the quiver and the other does not. I offer the quiver either way depending on how the customer wants it. Each Lonetree back quiver comes with a 3rd point adjustable, and removable, strap. In the bottom of the quiver I use a 1/4" piece of plywood covered with leather on the bottom and sheep skin wool inside. The large gear pocket measures 4.5" wide by 7" deep. I use a 3" wide gusset to make it easier to reach down into the pocket to retrieve items. The body of the quiver is 20" deep. 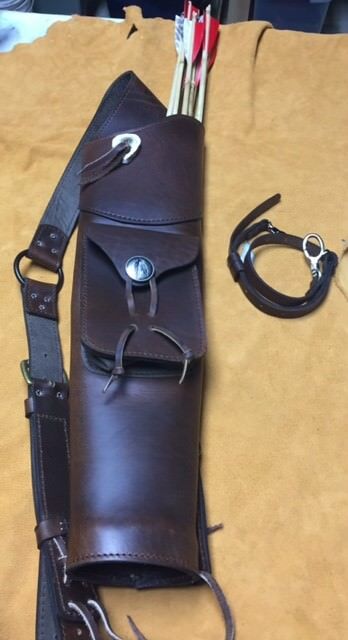 The vegtan leather I use comes from the tannery with a broke-in feel to it already making this quiver very comfortable and quite in the field as it will bend slightly in the middle of the quiver. The price on this new Lonetree back quiver is $250 plus actual shipping cost.